Such a beautiful and unique love story with this Lake Como wedding videography. Heidi and Shem had a dream come true wedding on Lake Como. Accompanied by a celebratory boat ride for their beautiful Italian destination wedding. We were the honored wedding videographers chosen to make this beautiful moment last forever. Doing what we most love to do. Especially relevant a Lake Como wedding videography. Even though we are wedding videographers on Lake Como. To be honest it’s always a surprise make a wedding video on this waterfront town. The weddings are always perfect just as Heidi and Shem’s. The sunset over the mountains. The gorgeous and perfect gardens. The lovely and delicate flowers. The boats on the lake. Everything a romantic bride wants for a fairytale wedding. 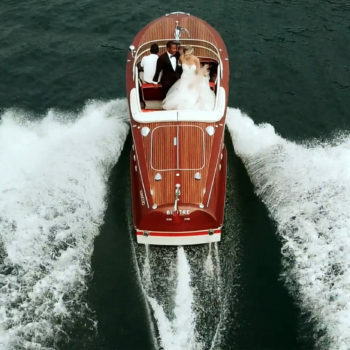 Talking about the boats, the newlyweds had so much fun boarding a powerful Riva Super Florida. What a thrill that boat. Obviously, we captured every moment on the boat ride with our drone. 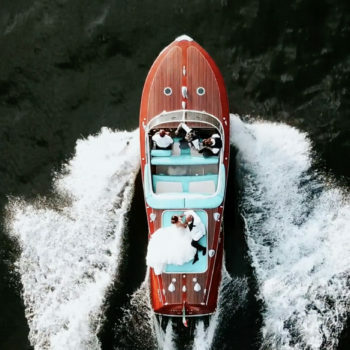 Take a look at the amazing drone takes in this wedding video on Lake Como. The ceremony took place in front of the lake and the wedding was held at the Grand Hotel Imperiale. Set in Moltrasio on the shores of Lake Como. Grand Hotel Imperiale is an Art Nouveau villa from the 1920s. It features an elegant restaurant which serves specialities of Lombardy and classic Italian cuisine. Perfect flavor for a wedding destination in Italy. The food, wine, and romantic atmosphere of the Italian Weddings are what attracts to many people from all over the world. The bride and bridegroom were gorgeous. Her wedding dress was also a romantic fairytale dress, elegant and classy. In conclusione we just love filming weddings video on Lake Como.